Many textbooks include diagrams of simple bar magnets with roughly semicircular field lines emanating from one end and returning to the other. Imagine those lines breaking and rejoining in a process called magnetic reconnection. This phenomenon arises often in plasmas – ionized gases that include protons and electrons. In fact, magnetic reconnection is thought to occur in plasmas ranging from laboratory experiments to planetary, solar and astrophysical environments. But magnetic reconnection is particularly troubling when it leads to explosive energy releases during solar magnetic storms, spewing out billion of tons of hot gas traveling at several million miles per hour toward Earth. Magnetic reconnection also lets this hot gas penetrate Earth’s protective magnetic field, leading to what’s popularly called space weather. One of the worst of solar storms, known as the Carrington event, happened in 1859. An amateur English astronomer, Richard Carrington, tracked its magnetic field, which roared through space and ripped through Earth’s own magnetosphere – the magnetic field surrounding our planet. The storm destroyed telegraph systems around the world, even causing some to shoot sparks. Researchers seek ways to forecast space weather, in hopes that countries could avoid such magnetically driven catastrophes, perhaps just by knowing ahead of time to turn off electronic devices. 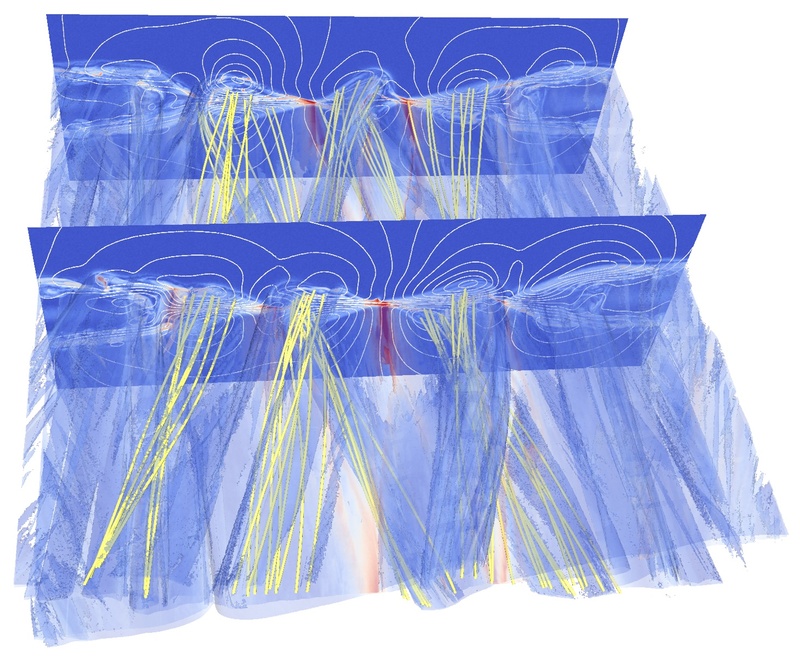 These forecasts require a better understanding of the processes behind magnetic reconnection. It starts with plasmas. “Most of the visible matter in the universe is in the form of plasma,” Karimabadi says. “Most of this ionized gas has a magnetic field embedded in it.” The Earth’s magnetic field usually deflects most of the magnetized plasma coming from the sun, but the shielding is less effective during extreme solar storms, creating havoc on technological systems, including communication satellites and power grids. Bill Daughton, a physicist at Los Alamos National Laboratory, explains. First, magnetic field lines in a plasma move with it, so if part of a large-scale plasma moves, the magnetic field lines can distort. “Think of the lines like rubber bands. They can become stressed in regions and, figuratively, snap and then move back together.” These magnetic fields store energy, and the snapping can take place quickly, releasing that energy explosively, something visible in a solar flare bursting off the sun.